For my birthday last month, both my parents and my in-laws were gracious enough to give me gift cards for Kohls. So I decided to do something wild and crazy. I bought new plates. I know. Living on the edge, right? We’ve been using plain white Corelle plates ever since we got married 15 years ago, and while they’re perfectly functional and great for kids, it was definitely time to upgrade to something that didn’t scream “These are college plates.” So I ordered two sets of these adorable plates while they were on sale and waited excitedly for them to come. When they did come, I tore into the box with all the anticipation of a kid on Christmas morning. The first box was quickly unpacked and the dishes placed directly into the dishwasher, but when I picked up the second box, I knew something was wrong. I could hear broken glass. With trepidation I opened the second box. Gingerly I examined the bowls and mugs. All were fine. 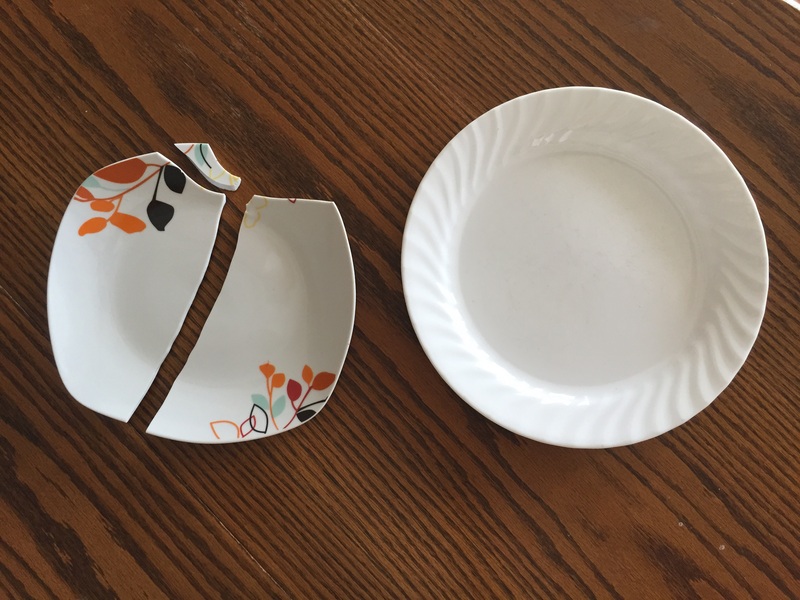 But when I pulled the plates out, sure enough, the top salad plate was cracked in half. Sigh. But hey, it could have been worse. One plate out of 32 pieces isn’t a horrible loss. Still, I contacted customer service to report the issue, hoping I wouldn’t have to send the whole shipment back over one little plate. The lady who helped me told me to toss that plate, order a new set, and they would adjust my account accordingly. By “adjusting my account,” she meant that they would refund me for the broken set and adjust the new order to match the original sale price plus free shipping. In other words, they were basically going to give me the rest of the “broken set.” Um, okay. Wow. Wasn’t really expecting that. I would have been fine with a $5 voucher or something, but she insisted on refunding the cost of the entire set. I emailed her back and told her I was more than happy to pay for it, since the rest of the pieces were usable. I wasn’t looking to get a whole set for free, after all. The response from my friendly customer service rep made me sad. She thanked me profusely for being so kind and honest and understanding. She said most people would have insisted on the refund and been upset about the whole thing. Unfortunately, she’s right. What does that say about us as a society in general? The “customer is always right” mantra is so engrained in us that we’ve come to expect full refunds, prompt responses, free and fast shipping, and generally getting what we want when we want it. Few people bother to complete surveys unless they’ve had a bad experience. Negative interactions almost always get more attention than positive ones. I’m guilty of that myself. So I challenge you to do something today. Seek out the positive. Compliment people on a job well done. It is Labor Day this week, after all. Smile at your clerk at the grocery store and thank her for her service. Look the bagger in the eye and tell him you appreciate his work. Log onto that website they circle for you on the receipt and give a good review. Catch your kids doing something right and praise them for it. Take two minutes to give positive feedback for a friendly ebay seller. In short, look for ways to build others up. You just might make their day. And while I’m thinking of it, I’d better sign off here. I have a Kohls survey to fill out. Author’s Note: In case you’re wondering, the new set of dishes is the Tabletops Gallery Brooke Soft 16-pc Square Dinnerware Set from Kohls. And yes, I highly recommend them. Love this!!! Over the weekend I printed and posted in everyone’s room (in my family) some positive thinking tactics and one of them was to compliment others. I accept your challenge Ruth! Great blog today!